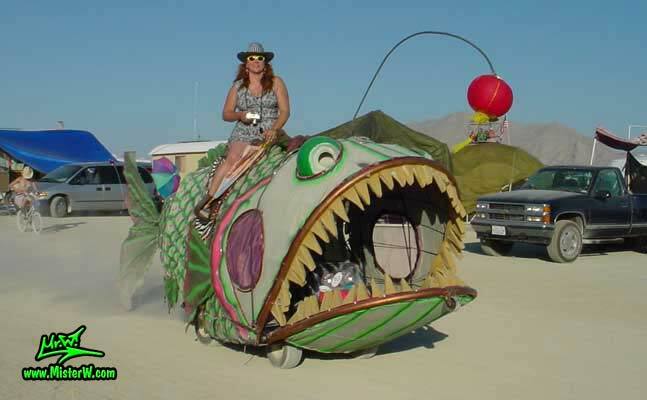 Yet, at Burning Man, there is a distinction between the term art car and a mutant vehicle. Generally, an art car is a street legal car having profound artistic expression. A Mutant vehicle, in contrast, is often not street legal and art in itself - that is motorized. When viewed, there is little revealing of what the original body of the vehicle is, and is sometimes made from scratch. Therefore, mutant vehicles are radical indeed. Furthermore, they can be massive, such as several trains long, or small, such as the size of a small golf cart. One imperative test is asked to an owner of a mutant vehicle: What interactive experience does it offer the people at Burning Man? Is it visual, or will it take you somewhere. Or both? (Don’t forget, visiting 40 square miles of art in the desert requires a lot of traveling.) Is it a nighttime visual experience, or a daytime symbol? Many of the designs incorporate qualities that cars rarely posses. Some of them emit flames, some offer tea or ice cream (for free, of course), and some of them look like they came straight out of a movie, such as a flying carpet. Regardless, mutant vehicles are a highlight at Burning Man and represent one of the amazing treats to interactively experience at this event. They also represent dedicated engineering, thoughtful design, testing, group participation, and fulfillment of all safety requirements. Mutant vehicles represent and art form in itself. Let’s take a look at some examples of mutant vehicles.